I have written of Lamont Reese twice before. (See The Possibly Transformative Case of Lamont Reese and The Disturbing Case of Lamont Reese.) Now I will tell his story in a slightly different format, present his Actual Innocence Scorecard, and then use his case as a subject no more. 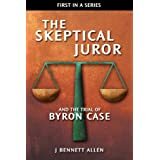 I will refer to his case as appropriate, but you will see no more Skeptical Juror titles similar to The Adjective Case of Lamont Reese. I'll explain why when I'm finished telling Lamont's story from a different perspective. It's not for the reason you think. 8:30 PM, 1 March 1999, Fort Worth, TX: A car pulls up outside a convenience store and drops off several well-armed men. Using handguns and semi-automatic rifles, the men spray the area with bullets. They kill three gang bangers and injure two bystanders. The car returns, the men hop back inside, and the car speeds away. 2 March 1999, Fort Worth, TX: Steven Kindred shoots Curtis Sealy, allegedly to silence him about the convenience store shooting the day before. March 1999, Fort Worth, TX: Steven Kindred is arrested for the shooting of Curtis Sealy. Facing the needle, Kindred begins offering the police stories in exchange for his life. The police are picky shoppers; not just any story will do. They reject the initial stories. Kindred, desperate to make a deal, offers a shiny new story. It's the story of Lamont Reese, a crack dealer known to police already. The police are smart shoppers, however. Surely, they tell the vendor, your life is worth more than that of Lamont Reese. Kindred agrees and throws in Lamont's girlfriend, Kareema Kimbrough. Still not good enough. The haggling continues for a while, and eventually Kindred throws Jason Leadly and Brian Johnson into the mix. That is still not good enough. It's a buyer's market; the police know it and Kindred knows it. In exchange for his life, he gives up the next best thing in the store: his freedom. Kindred admits to being involved in the convenience store shooting and to the shooting of Curtis Sealy. The entire package for his life and a possibility of parole. Deal, but only if Kindred throws in a lifetime warranty. No problem. If they would just allow him to talk to his girlfriend, he could have them a warranty in no time. March, 1999, Fort Worth, TX: The police begin bargaining with Steven Kindred's girlfriend. If she will simply stand behind the bill of goods offered by Steven, they would not charge her with aggravated sexual assault. It turns out that Steven Kindred was a mere 15 years old, while the girlfriend was 25. Deal. The girlfriend explained she had been smoking crack that day, all day long. Sometime a bit before 9 PM, Lamont Reese and the others dropped by her home. 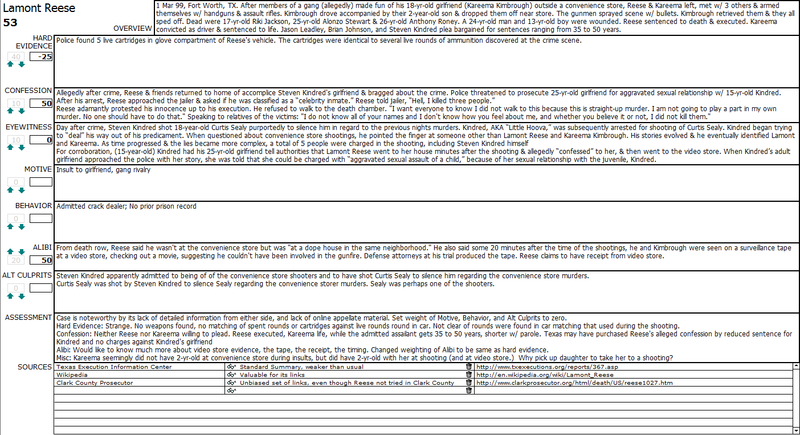 Lamont bragged about shooting three men with an assault rifle, then went to a video store with Kareema. The State had some gang bangers taken off the street for them, plus five convictions to boost their conviction rate, plus another execution to show they're tough on crime, AND a voting public more willing than ever to vote for "tough-on-crime" candidates. Steven Kindred, who confessed to the convenience store shootings AND the shooting of Curtis Sealy, avoided the needle and was rewarded with a chance for freedom in a few decades, one of which has already flown by. Kindred's girlfriend got "transactional immunity." In other words, because she testified as promised, she did no hard time for seducing the unworldly 15-year-old Steven Kindred with her crack-enhanced charms. Jason Leadly and Brian Johnson, who were late to the sale, got a few decades in prison, assuming they keep their noses clean. I presume clean noses would include never changing their stories about what happened that night. Kareema Kimbrough, who apparently refused to bargain, ended with life in jail. Lamont Reese, who absolutely refused to bargain, ended with a needle in his arm. Their daughter, two years old at the time they allegedly took her to a massacre and then to a video store, ended up an orphan, at least effectively so. As I mentioned in the previous posts, this case is distinguished by its lack of information. It's not surprising, therefore, that when I worked through my Actual Innocence Scorecard for Lamont Reese, I ended up with an ambiguous score. I scored him at 53. That means I calculate, based on the information I now have at hand, that there is a 53% chance he was actually innocent as he claimed, and a 47% chance he was actually guilty as Texas claims. 15 June 2004, Livingston, TX: Michael Toney put out an "urgent plea" for his fellow death-row inmate, Lamont Reese. Michael Toney's letter would be the one and only document I could find making a case that Lamont Reese was innocent. Lamont, he explained however, was more interested in obtaining justice for his girlfriend Kareema Kimbrough than he was about saving his own life. 20 June 2006, Huntsville, TX: Lamont Reese was executed for the convenience store shooting on 1 March 1999. 2 September 2009, Livingston, TX: Michael Toney was released from death row and from prison, having been exonerated of the bombing for which he was to die. 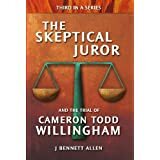 He had been accused and convicted based almost exclusively on the testimony of someone who traded a story for reduced prison time. 3 October 2009, East Texas: Michael Toney died in a car crash, a month and a day after gaining his freedom. There's something about this story that gets to me. I see Lamont Reese and Michael Toney staring at me. I read Michael's plea, and I'm moved by Lamont's concern for Kareema. I knew when I first wrote of them that the story wasn't over. I don't know if Steven Kindred lied about Lamont Reese. If he did, then he probably lied about Kareema Kimbrough, and may have lied about Jason Leadly and Brian Johnson to boot. I intend to learn more. No one can save Lamont or Michael. Perhaps someone can help Kareema. Join me if you wish as I investigate The Possibly Transformative Case of Kareema Kimbrough. I referred to Kareema and Lamont's child as their daughter. They had a two-year-old son at the time of the shooting. I definitely know that Kareema and Lamont were innocent. I do not know why the State of Texas chose to listen to someone who they know was and is a dangerous person. I am a first cousin of Kareema and she does not even have a angry bone in her body. When she was being picked on in school while living in New York, she would not even fight back or cause any problems. So for something as little as children fighting she would not jeopardize her or her son's life by participating in a massacre such as the one described. Many people judge but until you know a person, please don't. We have the hardest time trying to communicate with her because Texas is strict and would not allow cross state communication with her. Only after the trial were we able to even know where she was being held. I have other, later posts on Lamont Reese. Use the Google search utility at the upper left of my blog to find them if you wish to read them. I would like to hear from you directly. 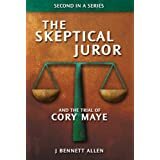 Please write me at skepticaljuror@gmail.com.